Vox Cantoris: Bishop of Rome welcomes his fellow Rotarians to the Vatican for audience -- Rotary funds Planned Parenthood! Bishop of Rome welcomes his fellow Rotarians to the Vatican for audience -- Rotary funds Planned Parenthood! In 1951, the Holy Office, now the Congregation for the Doctrine of the Faith, under the authority of Pope Pius XII issued a decree banning priests from joining the Rotary Club. It was reported in the secular press at the time. Freemasons were founding members of both the Lions Club and the Rotary Club. Gustave E. Loehr, a Mason, was a charter member of the Rotary Club (though it was founded by Paul P. Harris, who was not a Mason to my knowledge), and Melvin Jones, the founder of the Lions Club, was actually a Mason. But again - Lions and Rotary are not Masonic organizations. 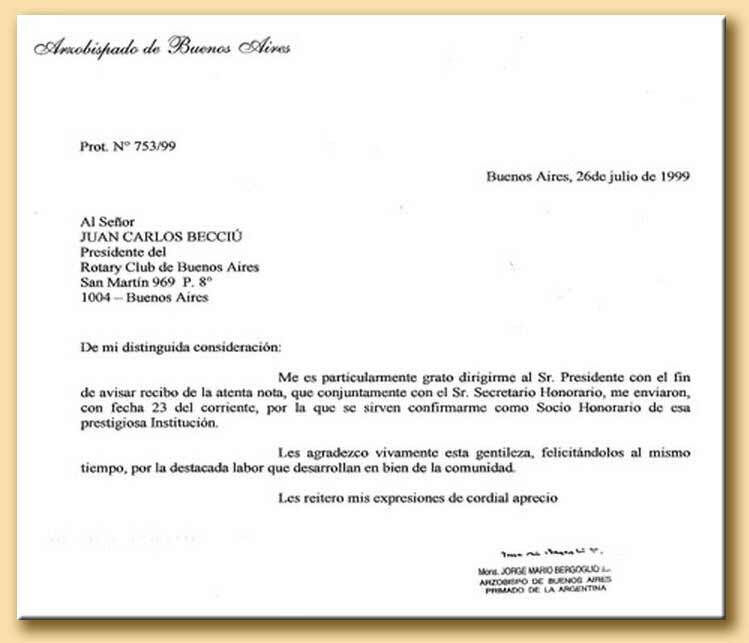 Notwithstanding the Holy Office's decree, in 1999, Jorge Bergoglio, Archbishop of Buenos Aires graciously accepted Honourary membership in the "prestigious organisation." Today, in Rome, Jorge Bergoglio, its Bishop, and at his invitation, had a special audience with Rotarians. (Vatican Radio) Nearly 9,000 Rotary members attended the Jubilee Audience in St. Peter’s Square on Saturday at the invitation of Pope Francis. A delegation greeted the Pope at the end of the Audience. Rotary, which brings together a global network of volunteer leaders dedicated to tackling the world’s most pressing humanitarian issues, kicked off the Rotarian Jubilee on Friday afternoon, with a conference on the challenges refugees are facing worldwide. The conference organized by the Jesuit Refugee Service - in partnership with Rotary, UNHCR and WFP - and entitled “Helping Refugees to Start Over”, focused on the work that can be done to give millions of refugees dignity and quality education – the best possible tool for them to be able to shape their lives, not lose hope, dream of a future. Linda Bordoni spoke to Ravi Ravindran, President of Rotary International about the Jubilee Audience with the Pope and about Rotary’s commitment to improving the lives of refugees. Mr. Ravindran called Pope Francis a model for Rotarians, saying "he is doing exactly what every Rotarian should be doing. So we see a great synergy of thought with this Pope, and being here, receiving his blessing, I think is something quite wonderful for us." "We are all very excited; we are passionate about this. We have Rotarians who have come from 80 countries to be present, so you can imagine the excitement." Mr. Ravindran compared the conference on giving refugees a new start to lighting a candle in the darkness. "I realize that trying to take on this whole problem is beyond us. I have to be honest and say that Rotary cannot solve this problem, but rather than cursing the darkness, we can light a candle. I definitely know of many, many Rotary Clubs who in their own small way are doing what they can to give refuge, to educate, to take care, to nurse refugees. So if many of us do what we are doing, then to a large extent the problem gets alleviated." Buenos Aires must be a hell-hole. In no other place could the likes of PF be nurtured. His electors knew what they were doing alright. None of them can have any faith in God as they don't display any concern about the four last things. Surely Pope Emeritus Benedict still has some good connections in high places that could lead us out of this mess. He must know that Vatican II hasn't worked as its not God's wish that it should, and now be willing, with the end of his life in front of him & the judgement to come, to disclose the muck and call himself for Vatican II & AL to be rescinded. 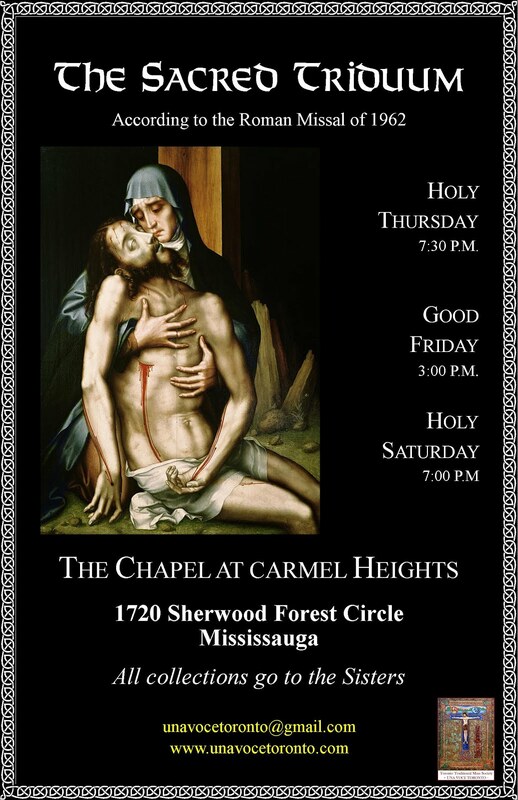 It is his duty to God and His Church to do so - he has nothing to lose but in so doing gain his own salvation and that of countless souls. Vox, please forgive me for this very off-topic comment. Please, obviously, delete this if you don't wish to post the following, but it does pertain to your great blog. Vox, I post comments only to your blog and Father McDonald's blog. I believe that it's been months since I posted, perhaps a couple of times, to any additional blog. I am not even certain that I did that. Anyway, I have for a good amount of time only posted here and at Father McDonald's blog. However, I scan headlines at several Catholic blogs. One such blog is OnePeterFive. I don't post there...in fact, I am unable to as I would first have to join Disqus...and don't even know what that is. Anyway, a story about Michael Voris on OnePeterFive had caught my attention. I read the story, then the comments. I found there a very unusual thing. 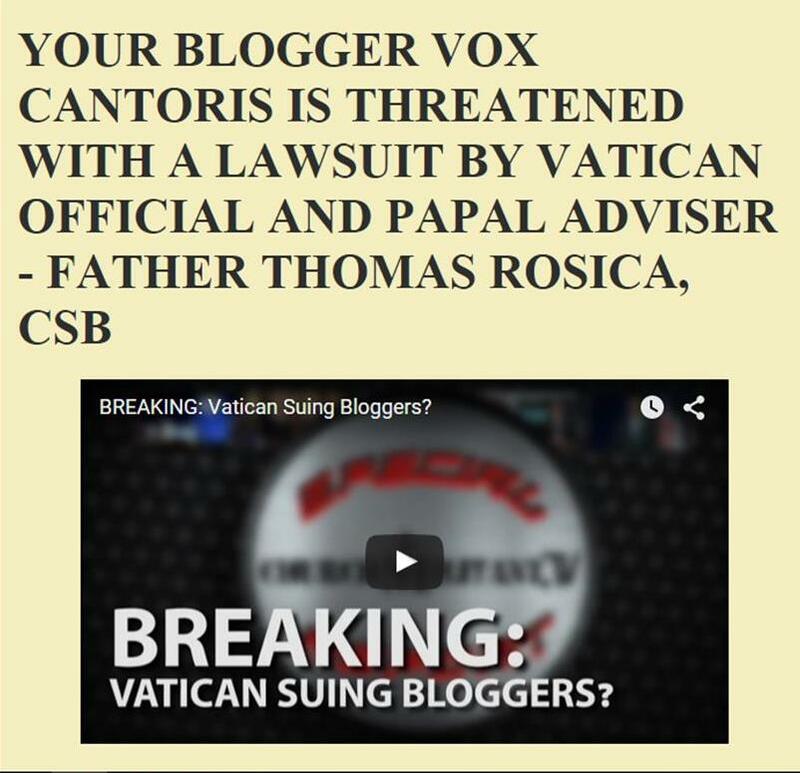 A person had copied and pasted a comment about Michael Voris that I had posted to your blog. The person uses the name StJnChrysostom. I have learned that StJnChrysostom has also posted frequently to The Remnant. Vox, do you or anybody here know StJnChrysostom or can tell me something about he or she? If anybody is familiar with other blogs where StJnChrysostom posts, and those blogs allow people to post without having to join Disqus, please let me know. I would like to ask StJnChrysostom why he or she copied and pasted my comment here, then pasted my comment as his or her very words to OnePeterFive's blog. You can look at StJnChrysostum's profile by clicking the icon attached and perhaps make contact by replying to a revealed post. I must say, though, this has happened many times to myself, and I'm sure others. The internet lends itself to this kind of thing. You don't own copyright by responding to articles online. Look on it as a compliment that they thought enough of your post to copy it as their own. Ana Milan, thank you for that information. I did as you said about clicking on the icon. I found a list of that person's posts. Incredible. Thanks again. You said that you've experienced the same thing. Wow. I guess that that goes on more often than I realize. I am still uncertain as to why somebody would just cut and paste something that somebody else had written, then present that as an original comment to post to a different blog. I would think that somebody who would offer their opinion via a blog's comment box would simply type their own words. Oh, well. Benedict XVI prays in communion with Francis. That's approval in my book. Symbol of Rotary : the cogwheel, also known as the cog (the word also in use for individual things butting out from it).